The city wants no part of a fringe neighborhood that would need expensive municipal services. Not unless it is rich. And yet if the people of East Aldine feel spurned by city government, they don’t show it. Rather than waiting for Houston’s embrace, they are organizing as a community to meet their own needs. Lately they have been working with Neighborhood Centers Inc., a nonprofit group that has quietly backed Houston’s poor for more than a hundred years. [Editors note: About a year after publication of this article, Neighborhood Centers changed its name to BakerRipley.] Led by director Angela Blanchard, Neighborhood Centers has grown into one of the country’s largest nonprofits, with 1,200 employees and annual expenditures of $280 million. With a budget one-twentieth of the size of Houston government itself, Neighborhood Centers provides core social services in the nation’s fourth largest city. Unlike agencies focused on a single mission, Neighborhood Centers addresses multiple needs of the poor, offering education, job training, child care, financial counseling, housing advice, health clinics, and legal guidance. Among the people who need these services the most are Houston’s immigrants. It’s been a rough year for immigrants in the United States. Donald Trump set the tone last summer when he kicked off his presidential campaign by casually slandering Mexican immigrants as drug runners, rapists, and scabs who should be thrown out of the country; later his target shifted to Muslims. Republican candidates fought over who most vehemently opposes a path to citizenship (or “amnesty”) for undocumented migrants, with Houston’s Ted Cruz taking the hardest line. Locally, the climate is friendlier. Immigrants boost the Houston economy, and business leaders almost unanimously favor immigration reform. Still, the city is segregated by race and income. The census map looks like a broken mirror, with white, black, and Hispanic shards radiating from the center. Immigrants face challenges including unequal access to affordable housing, education, healthcare, and high-paying jobs. What they have going for them is enterprise and ambition. Through Neighborhood Centers, Blanchard has assembled a coalition of business owners, political leaders, churches, and foundations who share her vision of empowering people through community education and shared services. Oil and gas are not the fuel Houston runs on. People are the fuel. People and their aspirations. Neighborhood Centers is trying to help them. A map of its activities includes 67 counties across East Texas: north to Tyler and Longview, south to Corpus Christi, and west to rural counties near Austin. But the bulk of its work takes place in the Houston metro area, comprising eight counties and 6.5 million people. Here it manages twenty-one Head Start facilities and five charter schools, eleven Workforce Solutions career offices, twenty senior service centers, and an adult day center for people with dementia. At the heart of it all are the five “Neighborhood Centers” that give the organization its name. They help community members gain business and computer skills, pass the GED, find jobs, access child care, learn English as a second language, file taxes, study for citizenship exams, and negotiate the complexities of immigration law. Two of the centers have credit unions where members can get a loan for a secondhand car (a critical purchase for any Houstonian who wants to work). The centers are clean, welcoming, comfortable places with couches in the waiting areas and books for children to check out. The next project on the horizon is the East Aldine Town Center, which is more ambitious than anything the organization has attempted. On a 61-acre site, Neighborhood Centers is working with civic partners to build commercial office and retail spaces, a community college branch, an outdoor community theater, a major grocery store, a sheriff’s office, and a medical clinic. Green space and walking trails will link pedestrians to Keith-Weiss Park. Construction is expected to begin this fall. It’s the biggest test yet for an organization that has achieved tremendous success as a social service provider. Can it be a city-builder at a larger scale? It’s the biggest test yet for an organization that has achieved tremendous success as a social service provider. Can it be a city-builder at a larger scale? Immigrants aren’t moving to Houston for the social safety net, which barely exists. Jobs are the safety net. What makes this city a magnet for immigration, both domestic and international, is an abundance of jobs. Nearly all major oil and gas exploration and production companies have headquarters or subsidiaries here, along with hundreds of firms engaged in renewable energy, biodiesel and chemical production, pipeline transportation, global shipping, international finance, and small manufacturing. In the first dozen years of the century, metro Houston led the nation by adding 530,000 jobs. 5 And despite the decline in oil prices, there is still demand for workers with what are called “middle skills”: carpenters, welders, electricians, plumbers. Not a restaurant meal gets served or a hotel room cleaned without immigrant labor, and most new homes are built by immigrant subcontractors. One of the great mysteries of American politics is that anyone regards immigrants as a drag on public welfare. In truth, nobody moves to Houston for the social safety net, which barely exists. Jobs are the safety net. Stan Marek understands the immigrant dream as well as anybody. His father and uncles emigrated from Czechoslovakia and founded Marek Construction shortly after World War II, and he worked his way up from union carpenter to owner. Now it’s one of the biggest firms in Houston, but Marek can’t find enough skilled workers. He is an outspoken advocate for immigration reform, on moral as well as economic grounds. So Marek let go a tenth of his workers. But they were not deported, he said. They simply went to other construction firms — his competitors — where they worked off the books, classified as subcontractors rather than employees. Subcontracting is the key to keeping undocumented immigrants in the workforce. Middlemen can charge the main contractor $18 an hour and pay laborers $10 an hour, with no health insurance, no retirement or disability benefits, and no workers’ compensation insurance. (Unlike other states, Texas does not require companies to join the state plan.) Often there is little job training and minimal safety measures. If workers fall off a scaffold because there is no railing, they are taken to emergency rooms for treatment, and the county picks up the tab. If they die in a workplace accident, their families are paid off for as little as $10,000. Undocumented relatives are afraid to complain. Marek is trying to do something about it. He wants people to have careers in construction, not just jobs. His company started a year-long training program that matches new workers with coaches who mentor them in the construction trades. At a graduation ceremony I attended last year, the audience was served a sit-down dinner of Mexican food, and then twenty-two young men and women were summoned up front to receive plaques recognizing them as skilled craftspeople. About half of the graduates had Hispanic surnames. Marek regards his company as a family, and he wants his employees to feel they are entering a lifelong relationship. Not surprisingly, he also serves on the board of Neighborhood Centers. If Houston’s undocumented workers were employed on the books, they would add $1.4 billion in tax revenue. The business case for immigration reform is clear. According to a study by the Greater Houston Partnership, an estimated 132,000 undocumented workers in the area earned $7 billion in 2008. If they were employed on the books and paid their full share of Social Security, Medicare, unemployment, and federal income taxes, they would have added $1.4 billion in state and federal revenue. 9 That’s not counting the multiplier effects of economic growth. A more recent study estimates that the undocumented workforce generates a net 3.3 million jobs and a net $33 billion in government revenue statewide. 10 Of course, undocumented immigrants pay state and city sales tax at the rate of 8.25 cents on the dollar, and they pay property taxes indirectly through their rent. Some pay income tax, hoping that a clean record with the IRS will help them gain legal status when Congress comes to its senses. Nevertheless, a lot of public money is falling through the cracks. Immigration reform would not only ease legal risks for employers but would provide revenue to cover the social cost of population growth. With so many Texas business and union leaders and Republican politicians supporting immigration reform, it’s surprising the state hasn’t been able to create change at the national level. Houston’s Charles Foster, the immigration lawyer Marek consulted, has advised three presidents (George H.W. Bush, George W. Bush, and Barack Obama) and former presidential candidate Jeb Bush. Foster said he had an immigration reform policy ready to launch early in George W. Bush’s first term, but the 9/11 attacks stopped it. By the time Bush was ready to try again, he had made the mistake of trying to privatize Social Security and didn’t have enough political muscle to advance a bipartisan bill. Then the recession hit, and the Tea Party backlash prevented congressional action under Obama. After Romney’s defeat, the “adults” in the Senate (as Foster called them) drew up a reform bill that would pass the House if only the speaker would put it up for a vote, but that never happened. Reform will have to wait for a new administration. South of the Houston Ship Channel, just beyond the glow of the petrochemical complex, is the working-class suburb of Pasadena. Modest brick houses and neat lawns back up against commercial streets lined with laundromats and Mexican meat markets. The Cleveland-Ripley Neighborhood Center — one of the five flagships for Blanchard’s organization — is located next door to a temp agency, across the street from a domestic violence shelter and a large Latino church. With his employer’s blessing, Hernandez volunteers for the Economic Alliance Houston Port Region. He speaks at student assemblies, proselytizing about the demand for middle-skill workers. Last year he visited twenty middle schools, aiming to get young students interested in science, engineering, and technology at an early age. If you ask the right question, you can build change. Ask what is working well. You create change just by listening. “I was surprised that parents and students don’t know there are opportunities out here,” he said. The decline in oil prices has hurt “upstream” industry jobs like oil drilling, but technical jobs are still plentiful on the “downstream” end, where oil and gas are turned into final products. As baby boomers retire, industry observers anticipate 300,000 openings for mechanics, electricians, pipefitters, welders, process technicians, and other skilled jobs that do not require a four-year college degree. 13 “I tell people if there’s one place where you can follow the American dream, this is it,” he said. Neighborhood Centers is funded by a mix of public and private sources and holds itself rigorously accountable for the money it spends. It follows government rules (Head Start alone has 1,800 of them, Blanchard said) but does not mistake itself for a bureaucratic agency. With governments at all levels hobbled by narrow mandates and political constraints, there is an opening for this private, entrepreneurial model that emphasizes communication, networking, and leveraging resources. The organization started small: It was founded in 1907 as the Houston Settlement Association, in a dilapidated neighborhood near the Port of Houston, by a schoolteacher who was alarmed by children’s living conditions. During the next half century, the association built three settlement houses across the city to serve immigrants and other disadvantaged people. Always it relied on the work of volunteers as well as paid staff. During the 1960s and ’70s, the houses nurtured the careers of black and Latino activists, who became state representatives and city council members and congressional representatives. Blanchard figured there was more to the story. In 2003, her staff began getting to know Gulfton residents and found a neighborhood filled with people who wanted to work and would strive to succeed. She described it as Houston’s Ellis Island (although New York’s Lower East Side might be a better comparison) and said that immigrants appreciate the population density because it instills a sense of community. They need to see people like themselves. Neighborhood Centers organizers began their process of appreciative inquiry, talking to residents and looking for community leaders. They discovered a grocery store where immigrants were buying spices their mothers had used back home. The storekeeper would even special-order items that neighbors requested. So, Blanchard said, “We go right to meet this woman. When we meet her, we discover she’s done this for everybody. She is the person they go to if they want to find out about Little League and a bus stop. She’s the de facto community leader.” She is not just selling spices, she is handing out information. We ask her who else is like her, and she gives us four names. That’s how we found the woman in Napoleon Square Apartments who was operating a completely illegal grocery store. Most of the families were lucky to have one car that took the wage earner to work, so you have to put a baby on your hip and walk through some unsavory streets to the neighborhood store. When [this woman] had use of the family car, she drove to a big-box store and bought things that people needed all the time and stocked them in her apartment. In 2010, the $20-million Baker-Ripley Center opened in the heart of Gulfton on the site of an abandoned nursing home. The complex features a child-care center, a tax center, a library, an arts-and-craft center, a clothing re-sale shop, a credit union, a commercial kitchen, and a welcome office. Neighborhood Centers also operates both a Head Start school and the Promise School, a state-funded charter school that educates 300 students in grades K-5. Most are the children of immigrants; they speak eighteen different languages. When the first graders visit the neighborhood center, they see the pennants of local and regional colleges: Baylor, Rice, A&M, Sam Houston State, and Stephen F. Austin hanging on the walls. The seeds of higher education are planted early. Often the most important loan is one that helps buy a used car or commercial vehicle; the credit union has even financed dump trucks. At the re-sale shop, community members learn basic business skills by conducting inventory, making sales, and running cash registers. At the credit union, families can open savings and checking accounts and get basic loans, circumventing the predatory lenders who charge high interest rates. Often the most important loan is one that helps buy a used car or commercial vehicle; the credit union has even financed dump trucks. Many workers are paid in cash, and the center helps them get a tax ID Number. The IRS wants your money, one of the officers told me, even if you are not a citizen. By offering free tax help, Neighborhood Centers puts money in the pockets of its members, whose average income is just over $26,000. The credit union urges people to save their tax refunds. It will pay $250 to families who keep $1,000 in savings for a year. I’m sorry. I didn’t mean to roll my eyes, but everyone is trying to create these precious neighborhoods. I remember being at a conference and someone said the thing we need to do with poor neighborhoods is make them walkable. I thought this was absolutely hilarious. If you’re in a poor neighborhood, your neighborhood is walkable. It might not be a nice walk or a fun walk, but you walk. … I actually love Houston for its total, messy, sprawling randomness. I get invited to conferences where people talk about Houston with frowns on their faces. People haven’t been able to figure out our city and how to make it smart and precious like other cities that no one can afford to live in. My biggest concern for this city is that it remains a place where you can start at the bottom and work your way up. Where it’s a good city to begin in, and where if you have a dream and water it with hard work, it amounts to something. For a couple of years she worked at a major accounting firm. She laughs about that job now, but it led to her career at Neighborhood Centers. And her instincts were right. To build a sustainable nonprofit, she had to run it like a business. That means keeping overhead costs low. Although the five community centers are the heart and soul of the organization, their combined operating budget is less than $10 million a year. The vast majority of funding — $263 million, according to the 2013-14 annual report — comes from government grants and goes directly into programs like education and job training. For example, nearly $190 million comes from the state’s Workforce Development Boards: the public-private boards, made up of government officials and business leaders, that are responsible for allocating state and federal tax money for job training. Workforce grants have been vital to Neighborhood Centers’ success. The American dream is a shape-shifting thing. Some imagine that it looks like The Woodlands, a master-planned community a half hour north of Houston on Interstate 45. With big brick homes on standard lots, perfectly situated shopping centers, and broad parkways running past artificial lakes and canals, The Woodlands bills itself as a sanctuary within a native forest. Major corporations have built their headquarters here, and median household income is close to $100,000. Someday it, too, may be annexed by Houston. 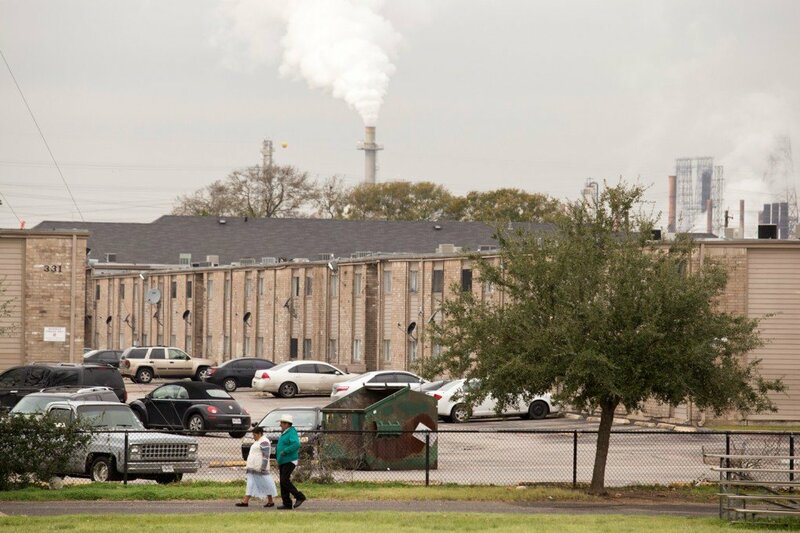 East Aldine may seem chaotic and poor and an unlikely place for the American dream, but it’s not. But the American dream is no less strong in East Aldine, with its small businesses and trailer parks on ditch-lined streets, bright with bougainvillea and towering hibiscus, shaded by banana trees and other semi-tropical foliage. Two generations of immigrant families live together in starter homes on deep lots. Their long backyards, perfect for soccer games, border tire shops and repair garages. Younger generations leave home, then come back and build bigger houses. There is no zoning here, no deed restrictions. One family parks a taco truck on their lot. They pour a concrete slab and set down tables and chairs, build a roof over the tables, string up Christmas lights. Another family has started a business reselling wood pallets, stacked two stories high in the back. Trucks rumble into the yard of a cement mixing company where a garden sprinkler keeps the dust down. East Aldine may seem chaotic and poor and an unlikely place for the American dream, but it’s not. Dozens of shops line Aldine Mail Route, the four-lane country road that is the main thoroughfare: Taco la Bala, Pizza Patron, Speed X Check Cashing, Flat Tire, Cricket Phone, Cash America, Metro PCS, Title Loan Services, Family Dollar, Scrap Metal, Supermercado with Western Union. Muffler shops, pawn shops, tortillerias, small churches in metal buildings. Car insurance starting at $29 a month. No license, no credit check, no bank account, no problem. Mattresses and beds and children’s bicycles stacked in the open air by the side of the road. At Alma Latina Seafood & Taqueria, two dozen people sit for lunch at one long table. The waitresses bring platters with pineapples sliced in half and filled with boiled shrimp. Alma Latina, Latin soul. This, too, is the American dream. The Woodlands is where you buy your way into the dream. You announce your wealth and send your kids to private school and leave the problems of the city for someone else to solve. East Aldine is a place you are born into, or drawn to. You work your way up but not out. The public schools are a source of pride and community development. Students graduate and come back to teach. People help themselves and others. When Neighborhood Centers began working with the community in 2013, organizers found a level of enthusiasm they had never seen before. They interviewed residents about what made them proud to live in East Aldine, and they identified a network of community leaders. Out of those conversations came the vision for a town center on the sixty-one-acre lot on Aldine Mail Route, backing up to the big city park. Neighborhood Centers created a bubble diagram, the Aldine Voices Report, that describes the network of ideas that emerged from the two-year process of appreciative inquiry. They’ve mapped dozens of concepts and relationships, and Blanchard hopes to engage Google engineers to refine the visualization. She doesn’t care about ribbon cuttings. She cares about human capital. The fanciest community center in the world means nothing if you don’t identify the structural relationships that can sustain it. Neighborhood Centers has committed $20 million for the East Aldine Town Center, and when I met Blanchard last summer she seemed genuinely worried about meeting the target. But Houston donors came through, even as the oil economy wilted. Now the project is fully funded and on track to break ground this fall. The announcement came in February at a fundraising luncheon attended by 800 people at a downtown hotel. A gigantic screen, nearly as wide as the ballroom, thanked Houston’s biggest corporations, banks, and law firms, and prominent philanthropists. The room buzzed about keynote speaker Darren Walker, president of the Ford Foundation, which has recently consolidated its grantmaking programs to focus on combating inequality. Walker grew up in a shotgun house a few miles down the highway from Angela Blanchard’s hometown of Beaumount, and he attended one of the state’s first Head Start programs in 1965. With a strong education, he rose out of poverty to lead an institution responsible for half a billion dollars in annual grantmaking. That morning he had taken a tour of the Baker-Ripley Center in Gulfton. Armando Walle, the young state representative from East Aldine, also addressed the donors. He was raised in the neighborhood, the oldest of five children. When he was thirteen, he said, his father went to prison, and so he had to grow up fast. He graduated from the Aldine school district, attended the University of Houston, and worked for a U.S. congressman. In 2008 he ran for state representative in the Democratic primary against a longstanding incumbent and out-campaigned him by walking door-to-door. 16 Four years ago, he approached Blanchard with a folder full of maps and data, and he asked her to talk to the people in his district. The conversation hasn’t stopped since. When the new facility opens, East Aldine — that hole in the donut — will have its own center of gravity. Blanchard reminded the audience that the first gift for the East Aldine Town Center came from the community itself, which provided the land on which to build. In another time or place, that social infrastructure would be understood as a public responsibility, even as the core function of government. But here in Houston, we do things differently. Of course, entrenched inequality does not reverse itself overnight. For Houston’s transformation to be more than superficial, it will need to encompass the entire region, from Pasadena to Gulfton to Aldine, and include all its people: urban and rural, native and immigrant. Is that even possible in a city whose philosophy is “run like hell in your own lane”? What does the American dream look like in this “messy, sprawling, random” place? It seems like such a simple thing: a city organized around diverse, inclusive neighborhoods, supported by a basic social infrastructure — education, jobs, healthcare — that is accessible to all. In another time or place, the provision of that infrastructure would be understood as a public responsibility, even as the core function of government. But here in Houston, we do things differently. A private organization, funded mostly with public money, has stepped in to fill the gap, and it has set an example that could be followed in other cities where government action is constrained. Outside the luncheon, thousands of well-dressed people milled about. A conference for the oil and natural gas industry was also being held in the hotel. I overheard one young man on a cell phone talking about $50,000 for this, $350,000 for that — the kind of business deals that people imagine when they think about Houston. But the landscape is shifting here, and activists are making deals on an equally grand scale. Teenagers in Gulfton just talked the Houston City Council into spending $400,000 to build a skateboard park. They boosted their campaign by printing and selling T-shirts. “We’re not as stupid as we look,” one of them told a reporter. Politicians and corporations are learning that the most productive approach to dealing with inequality comes not from the top down but from the bottom up. This is the second article in an ongoing series, “The Inequality Chronicles,” supported by The Kresge Foundation. To date, the series includes articles on Memphis, Baltimore, and Chicago, in addition to Houston. Neighborhood Centers Inc. last received funding from The Kresge Foundation in 2009. The foundation, which has supported this series on Places, did not participate directly in the commissioning or editing of articles, and was not involved in the decision to focus on Neighborhood Centers. East Aldine Management District, 10 Year Report, 2011. Bruce Katz and Jennifer Bradley, The Metropolitan Revolution: How Cities and Metros are Fixing our Broken Politics and Fragile Economy (Washington, DC: Brookings Institution Press, 2013). Social, Economic and Demographic Characteristics of Metro Houston, Greater Houston Partnership, October 2014. Rolf Pendall and Margery Austin Turner, Expanding Access to Economic Opportunity in Fast-Growth Metropolitan Areas, Urban Institute, May 2014. According to the advocacy group Texas Forward, the state ranks 49th in spending on Medicaid and public assistance and 50th on mental health services. Jeffrey Toobin, “American Limbo,” The New Yorker, July 27, 2015. Patrick Jankowski, Potential Tax Revenues from Unauthorized Workers in Houston’s Economy, Greater Houston Partnership, January 2012. Texas Needs the Workers! An Analysis of the Economic and Fiscal Impact of Undocumented Workers, The Perryman Group, February 2016. Clifford Pugh, “Outspoken Harris County Hospital District CEO David Lopez Has a Plan for Health Care in the Obama Age,” CultureMap, July 29, 2010. Dave McNeely, “Abbott — The $94 Billion Man,” The Port Arthur News, May 28, 2015. Addressing Houston’s Middle Skills Jobs Challenge, Greater Houston Partnership, April 2014. Gulfton was the subject of a 2005 article in Places by University of Houston architecture professor Susan Rogers. See Susan Rogers, “Superneighborhood 27: A Brief History of Change,” Places Journal, Vol. 17. No. 2, Summer 2005. East Aldine Management District, 10 Year Report, op cit. Claudia Feldman, “Armando Walle Steps Into Role as State Representative,” Houston Chronicle, January 18, 2009. Michael Berryhill is chair of journalism at Texas Southern University and author of The Trials of Eroy Brown: The Murder Case that Shook the Texas Prison System.